It’s the holiday season, the season of giving…but what do you get your favorite softball team or player? Don’t stress – we’ve got you covered! We’ve packaged our most popular player items to help make your gift-giving a breeze! With the holiday season in mind, we’ve put together some Holiday Packages that will certainly bring a smile to every softball player in your life. Great for stocking stuffers, or team parties – we’ve packaged our most popular softball gift items just in time for the holidays. 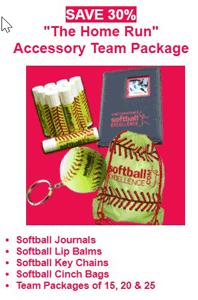 Check out the great packages and the great savings – and help your favorite softball team have a Happy Holiday season! Order “The Triple” Accessory Team Package Today! 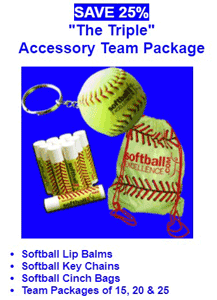 Order “The Home Run” Accessory Team Package Today!